Well, it looks like another month has come to an end! And what a fun filled month it was! A month in which we saw the Punk Mascot get a punk album, the Snowman Mascot get some snow slushies, and one lucky reader get some top blogging advice from yours truly! And we also got to meet the fantastic Two Bad Bananas, Nonesuch Garden, Tivity Creations and many more! And what about our monthly puzzle? 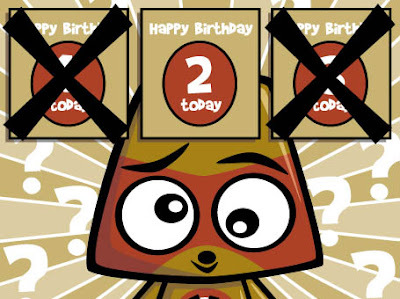 Did you work out which card the Miffed Mascot should’ve picked for our birthday? That’s right! It was the 2 today birthday card! Well, it was pretty obvious considering we’d just had a post entitled Happy 2nd Birthday! Maybe I should have a word with the Puzzle Mascot about making his puzzles a little bit harder! Anyway, that’s all for this month, but be sure to come back next month when we’ll have plenty more kawaii treats for you all to enjoy! And hopefully a better puzzle too!